Srinagar: Kashmiri students studying at Ganga Institute of Management and Technology in Haryana alleged they were beaten up and harassed by their counterparts and security guards in the campus. Students who called Kashmir Reader said a student Mujahid Zahid got injured after he was severly beaten up. “Police came to the campus but did not take any action. We feel insure. We are here harassed by students, staff and security guards of college. Many students were beaten up,” they said adding Zahid was been removed to hospital. Coordination of Democratic Rights Organization denounces the arrest of Khurram Parvez on the intervening night of 15-16 September at 12.30 AM from his house at Srinagar. He had returned from Delhi in the very morning of 15th September after being detained for nearly two hours and prevented from travelling to Geneva for the UN Human Rights Council’s meeting. Khurram Parvez is chairpersons of Asian Federation Against Involuntary Disappearances (AFAD) and Coordinator of Jammu and Kashmir Coalition of Civil Societies. Reports say that Chief Minister Mehbooba Mufti was not aware of the arrest. J&K Police have refused to specify the charge against him and it is unofficially said that he has been taken into Preventive Detention. We fear his detention under the draconian Public Safety Act, which has seen thousands of Kashmiri people suffered under years of detention without being charge-sheeted for having committed any crime. His arrest is a signal to the civil society in J&K to become mute over the gross and egregious atrocities inflicted on the people and violation of all International Humanitarian Laws and India’s Constitutional rights. The spree of killings since July 08, 2016, has seen 84 dead, blinding by pellet guns of more than 200, injuries caused to more than 12,000 persons, night raids, arrests of more than 1000 persons, and now the renewal of dreadful Army operations “Calm Down” in South Kashmir. These are all hallmark of a ruthless and illegitimate authority trying to yet against militarily suppress a people whose eminently democratic demand is for exercising their right of self-determination. Crimes and acts of brutality committed by the Indian State were documented by JKCCS, through their rigorous research and analysis was brought before the public. Their reports on Mass Graves, Enforced Disappearances, Massacres, Rapes, Custodial killings etc are testimony to their labour. They took up and fought case legally by moving the judiciary, as they did in the Handwara girl case recently which exposed the police leadership for their torture of a juvenile girl in their illegal custody. It is to silence such voices from highlighting the brutal military operations currently underway in Kashmir, is why Indian State is cracking down on them. Our rulers are scared that Truth will singe them and therefore, do not want the Indian public to know anything about what the soldiers are being made to do to crush the civil disobedience by the populace. We appeal to the India’s democratic minded that their silence and conspicuous absence of outrage over the crimes inflicted on people in Kashmir and the arbitrary arrests, an ongoing saga, is encouraging the Indian State and its clones in the media from persisting with their sinister policy and distorting the real story of J&K people’s struggle against oppression and manipulative politics for 68 years. If all this seven decades of military suppression have not erased the demand for referendum we urge everyone to take heed of this un-suppressible mood of the people. We therefore appeal to Indians democratic minded to stand up against oppression and in support of right of self determination by all the ‘state subjects’ of Jammu and Kashmir, so as to bring to a close India’s horrific seven decade old record of crimes committed against the people. 7. Begin the political process for ascertaining the democratic will of all the people of J&K. Coordinators of CDRO: C. Chandrasekhar (CLC, Andhra Pradesh), Asish Gupta (PUDR, Delhi), Pritpal Singh (AFDR, Punjab), Phulendro Konsam (COHR, Manipur) and Tapas Chakraborty (APDR, West Bengal). Constituent Organisations: Association for Democratic Rights (AFDR, Punjab), Association for Protection of Democratic Rights (APDR, West Bengal); Asansol Civil Rights Association, West Bengal; Bandi Mukti Committee (West Bengal); Civil Liberties Committee (CLC, Andhra Pradesh); Civil Liberties Committee (CLC, Telangana); Committee for Protection of Democratic Rights (CPDR, Maharashtra); Committee for Protection of Democratic Rights (CPDR,Tamil Nadu); Coordination for Human Rights (COHR, Manipur); Human Rights Forum (HRF, Andhra Pradesh & Telengana); Manab Adhikar Sangram Samiti (MASS, Assam); Naga Peoples Movement for Human Rights (NPMHR); Organisation for Protection of Democratic Rights (OPDR, Andhra Pradesh); Peoples’ Committee for Human Rights (PCHR, Jammu and Kashmir); Peoples Democratic Forum (PDF, Karnataka); Jharkhand Council for Democratic Rights (JCDR, Jharkhand); Peoples Union For Democratic Rights (PUDR, Delhi); Peoples Union for Civil Rights (PUCR, Haryana), Campaign for Peace & Democracy in Manipur (CPDM), Delhi. Six Kashmiri Muslim students belonging to Sarhad, an organisation which brings semi-orphans from strife-torn regions to live and study at their school and college in Pune, share their hopes for their state and their experiences outside it. Jyoti Punwani reports. They are young Kashmiri Muslims who have lost fathers or close relatives in the unending conflict in the Valley. Some were killed by the army, some by militants. Yet, it is only when goaded into spelling out their stand on the current azaadi movement in Kashmir, as they were in a press conference in Mumbai’s Press Club on Thursday, that they mention their own tragedy. Their obsession is not azaadi, or the Army’s long presence in their state, though the latter is never far from their mind. Their mission is different — how to get as many youth as they can out of Kashmir so that they can also avail of the opportunities they themselves have. 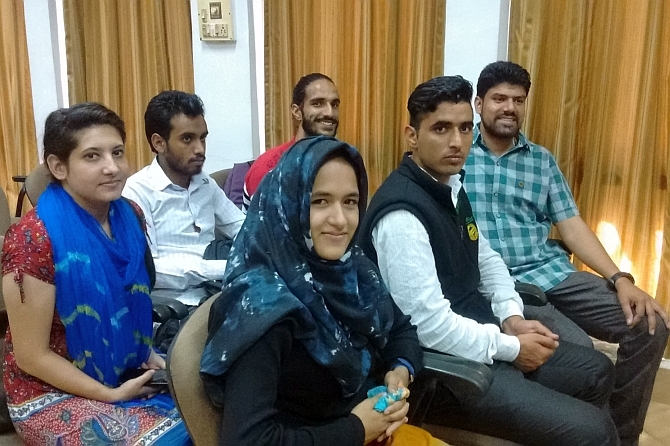 Six students belonging to Sarhad, an organisation which has been bringing semi-orphans from strife-torn regions such as Punjab and the north-east to live and study at their school and college in Pune, were in Mumbai to share their hopes for Kashmir. They admitted their aims were limited. But, quoting Rabindranath Tagore, they said that a lamp may not dispel the darkness completely, but it can at least light up its surroundings. These six have spent their childhood far away from the war zone. Unlike most Kashmiris, they can read and write not just Hindi, but even Marathi. They help in Ganpati and Dahi Handi celebrations, despite knowing that’s forbidden in Islam. “But we do so from a humanitarian point of view, not from religious,” said Zahid Bhatt, a law graduate doing his Masters in Political Science from Pune University. The message these boys and girls want to convey is simple: Kashmir is not just terrorism or natural beauty. There are ordinary Kashmiris who have normal aspirations which have never been fulfilled, who neither throw stones nor join the azaadi protesters. And the message they carry when they go home every year is that India is not just the Army and the para-military forces. There are ordinary Indians who are ready to treat them with affection. These six students were part of the first batch of 114 students from Kashmir who came to Sarhad in 2003 as children. Their families sent them with Sarhad’s founder Sanjay Nahar because they wanted them to get away from their violent surroundings. Two of Zahid Bhatt’s uncles were shot by the Army; the 12-year-old had started talking of taking to the gun. Mushtaq Khoja’s father was killed by the security forces; his family committed him to Sanjay Nahar’s care when he was just 7. He hails from Dardpura, a village separated from Pakistan by just one mountain and one river. The journey to Pune from their villages was traumatic, recalls Rubina Mir from Kupwara, who was just 5 then. “I had only been told that I was being taken to Srinagar. I cried all the way to Pune and for months after that,” she recalls. She and Nasreen Bano, who’s from Kargil and a year older, were kept together in the train, yet they could not communicate with each other because their languages were different. Language became the biggest barrier in Pune. Those from village schools spoke only Kashmiri. To add to their bewilderment was Pune’s climate, its buildings, its traffic. Perhaps the biggest adjustment was the food, which was not only vegetarian but completely different. Most of the children came down with chicken pox and other skin diseases. It took them six months to settle down. “Sanjay sir and his wife treated us like their own children. And our teachers were very nice, teaching us Hindi with so much patience,” recalls Rubina. Dilbar Khwaja, a student of their batch, this year scored 89% in Marathi, they say. “A Kashmiri scoring so much in Marathi, imagine!” They can barely hide their pride. Not everything about Pune was unpleasant, though. If Pune was another world to them, they found that Kashmir was also alien to the average Punekar. At first, parents in Pune didn’t want to send their children to a school where 114 Kashmir children had been admitted. “I am not an outsider, I am from Kashmir,” Zahid replied in Marathi. While villagers were even more ignorant about Kashmir, Rubina found even her classmates in college (she’s in Standard XI) vague about Kashmir’s location, her language and her head scarf. With Sarhad, they toured Maharashtra, living with locals, specially those notoriously averse to Muslims and to Kashmiri Muslims. “After living with them for a few days, these people would tell us how mistaken they had been. Our mindsets also began changing,” they recounted. IMAGE The six Kashmiri students at the Press Club, Mumbai, on Thursday. Back row (left to right) Nasreen, Javed, Manzoor; Front row (left to right) Rubina, Mushtaq and Zahid. Photograph: Jyoti Punwani. The first few times they went home, they were looked upon with suspicion by their neighbours. “Have they converted you,” was the commonest question. However, after some years, the suspicion changed to envy. “My classmates dropped out of school; some work as drivers despite being educated,” revealed Javed. “My village has three PhDs; seeing them jobless, 40 other youth decided to drop out of college,” said Mushtaq. 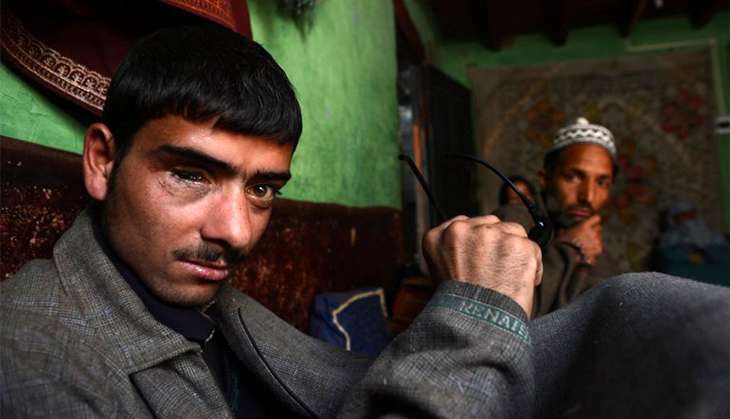 Javed, who is pursuing his Bachelors degree, ascribes much of Kashmir’s unrest to joblessness. According to them, the hopeless employment situation in Kashmir makes most youngsters long for jobs in India — not Pakistan, they point out. As you talk to them, it becomes clear that it’s not just the lack of jobs that agitates them. The lack of “dignity” angers them as much. The constant checking of ID cards by the security forces when they go home; and when they are outside Kashmir, the frequent questions about whether they want to be with India, are things they find intolerable. Rubina left her village this time after Ramzan Eid, amid the ongoing unrest. There were no buses to Srinagar; she had to take an ambulance at night. Even at the press conference in Mumbai, a journalist asked Javed in private whether he wanted to remain with Hindustan. But their years in Sarhad have given them a grounding so solid that none of this moves them from their goal: to bring as many youth as they can to Sarhad so that they can experience the India like they have. “If Burhan Wani had just stepped out beyond Jammu and lived anywhere in India, he wouldn’t have become a militant,” says Javed. Their long term goal is to go back and work in Kashmir, where Sarhad has centres. Javed wants to become a lecturer; Manzoor Bashir, who’s doing his Masters in English Literature, is a choreographer and dancer; he has also made a short film and acted in it. “There is no dearth of talent in Kashmir; it just needs to be brought forward,” says Manzoor, whose father, a policeman, was killed by militants. These youngsters, who are on a Jago Bharat yatra across Maharashtra, have no solution to the current unrest, for according to them, none of those who have the power to resolve the crisis want to do so. “How come that despite the presence of the army everywhere, a Kashmiri can get a gun in 24 hours? Who is supplying these weapons and why are they not being stopped,” asks Javed. Hence, their conviction that it’s apolitical people like themselves who can make a difference to the youth. 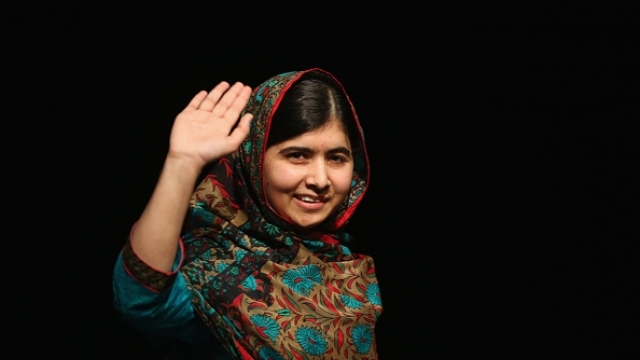 “I call on the United Nations, the international community and India and Pakistan to work together with utmost urgency to right these wrongs’ – Malala. Pakistan army chief General Raheel Sharif on Tuesday described Kashmir as Pakistan’s “jugular vein” and said Islamabad will continue to support the people of the Valley on the “diplomatic and ethical” fronts. “We salute the great sacrifices of the people of Kashmir for their right of self-determination. The solution of the problem lies in the implementation of the resolutions of United Nations in this regard. Pakistan will continue to support Kashmir on the diplomatic and ethical fronts,” said the chief of army staff, addressing a ceremony held at General Headquarters in Rawalpindi to mark the country’s Defence Day. General Raheel praised people of the Valley for rendering “innumerable sacrifices”. The army chief asserted that “the defence of Pakistan is invincible”. “I want to make it clear to all the enemies that the defence of Pakistan already strong but now it has become invincible,” he was quoted as saying by theExpress Tribune. On the challenges the country is facing, he said: “I want to make it clear that we are fully aware of all covert and overt intrigues and intentions of our enemies. Be the challenge military or diplomatic; on the borders or within the cities, we know our friends and foes all too well.” On Pakistan’s ties with China, the army chief said the greatest example of a relationship based on mutual respect and principle of equality in the region is the Pak-China friendship. “China Pakistan Economic Corridor (CPEC) is the paramount evidence of this relationship. I would like to assure that we shall not allow any external force to obstruct it and any such attempt will be dealt with iron hands,” he said. General Raheel said the Operation Zarb-e-Azb against terrorists had achieved its objectives to confront terror, saying the armed forced will go to any limit to ensure Pakistan’s security. He praised the military, police and other law enforcement agencies for their “utmost efforts” to establish law and order in the country. In what is considered the highest militarised zone in the world, Post Traumatic Stress Disorder takes an inexorable toll. Srinagar looks a dead city. Instead of streets full of tourists, men in uniform parade its alleys, and, as you would expect in any curfewed city, the streets are empty and the shutters of shops down. Few kilometres away from Srinagar’s centre, the Shah family lives in Chattabal, comparatively an older part of the city. There is an insidious gloom and it’s understandable – the family has lost its youngest member, Reyaz. The 21-year-old, who worked two jobs – as an ATM security guard at night and a salesman at a kitchenware shop during the day – was killed on August 2, supposedly after being hit by pellets. Shah is one of the 71 people killed – that includes two police officers – after massive protests erupted in the Kashmir valley following the killing of popular Hizbul Mujahideen commander Burhan Wani in early July. The protestors are demanding “Azaadi” from India. As usual, the Indian government has blamed Pakistan for fuelling the stir in Kashmir and Islamabad has categorically denied involvement in the protests, accusing India of human rights abuses in the same breath. At around 10pm that fateful night, Reyaz was returning home after completing his shift at the ATM. His elder brother, Shakeel Ahmed Shah, aware of the dangers of stepping out in the curfew, kept calling his brother to know his whereabouts. Reyaz told him he had been shutting down the ATM. A few minutes later, Shakeel was not able to reach his brother’s phone for a second call. He was worried, but there was not much he could do. But around 11.30pm, Shakeel received a phone call from an unknown number asking him to reach SMHS Hospital immediately. At the hospital, the family learnt that Shah had been found lying on the road, bleeding profusely. The paramilitary forces, supposedly CRPF, had fired pellets at him from a close range, which apparently killed him on the spot. According to the doctors who conducted an autopsy on Shah’s body, around 300 pellets were lodged into his defenceless frame. While many have died in the conflict due to the use of firearms, some of them have, surprisingly, succumbed to “non-lethal weapons”, a term used by the government to identify low intensity arms used to quell protests. Critics and residents of the Valley, however, allege the “non-lethal weapons” often turn deadly if used from a close range, as in the case of Reyaz Shah. Even in the 2010 protests, in which 112 people lost their lives, it was the tear gas shell, a non lethal weapon, that became the reason for the eruption of the Valley. A shell allegedly fired by the security forces, hit a young Tufail Mattoo, and the incident turned into a rallying point for massive protests. At Shah’s house, his sisters are inconsolable. They break down intermittently. His elder brother Shakeel, tries to maintain his composure, but even he is overwhelmed. Reyaz spoke to him over the phone moments before his death. The family was waiting for him to join them for dinner. “Reyaz was returning from work. We wouldn’t have let him go out had the government not threatened to cut the salaries of employees who fail to turn out to their work. No protest was going on in the vicinity. Even then he was killed. It is a murder,” said his niece, the only family member who speaks with some determination. Reyaz’s parents died when he was only three-months-old and his elder siblings raised him since. The eldest of the sisters often faints and had to be taken to a psychiatrist. Dr Arshad Hussain, associate professor, psychiatry, at Shri Maharaja Hari Singh Hospital (SMHS) Srinagar, sees up to 130 mental health cases a day. He paints a grim picture of the psychiatry-related health issues. “90 per cent of Kashmiris have faced a traumatic life relating to conflict in Kashmir. We have an epidemic of mental health problems, particularly depression,” he says. Over the years, the number of patients visiting SMHS’ psychiatric department has increased rapidly. According to Dr Hussain, the hospital saw more than 1,00,000 patients last year compared to around 1,700 in 1989. The Shah family’s story is synonymous to many other families in Kashmir who have lost their dear ones in the last three decades. The latest deaths and grave injuries by “non-lethal weapons” has added to the trauma of people. Thousands are stuck in their houses since a strict curfew is in force. The government has snapped phone and internet connectivity. The supply of essential goods and medicines is running out and security forces have allegedly attacked the ambulances ferrying patients and injured. Kashmir is a 70-year-old conflict between nuclear armed countries, India and Pakistan. Armed insurgency broke out in the region in late 1980s. 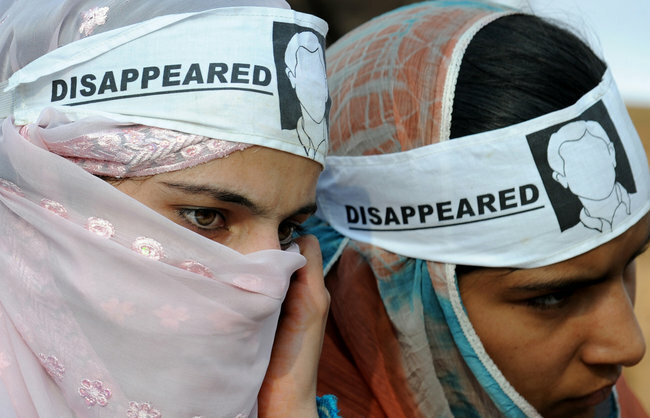 According to South Asia Terrorism Portal 44,033 people were killed in the Valley – All Party Hurriyat Conference claims 1,00,000 died – and thousands have disappeared and suffered torture, allegedly by the security forces and armed mercenaries. Relentless curfew and crackdowns have taken an inexorable toll on mental health. In what is considered the highest militarised zone in the world, many residents face Post-Traumatic Stress Disorder (PTSD), and women are the worst-affected. A 2009 study done by Sher-e-Kashmir Institute of Medical Sciences, Srinagar on “Life in Conflict: Characteristics of Depression in Kashmir” found the prevalence of depression in the region is over 55 per cent. A survey done in 2015 by Medecins Sans Frontieres (MSF) (Doctors without borders), and Department of Psychology, Kashmir University and the Institute of Mental Health and Neuroscience (IMHANS), says nearly 1.8 million adults (45 percent of the population or one out of every two adults) in the Kashmir Valley show symptoms of significant mental distress. “Nearly one in five adults (19 per cent) in the Kashmir Valley is living with significant PTSD symptoms, representing 7,71,000 individuals, with 2,48,000 (6 per cent) meeting the diagnostic criteria for PTSD,” says the MSF. Although, the impact on mental health due to the current stir is not clear, doctors suspect there would be a steep rise in PTSD in the Valley. “The reflection on mental health will not happen immediately. The effects of trauma of 90s, we have seen in early 2000. What happened in 2008-2010, we started seeing [its effect] from last year,” says Dr Hussain.”I have currently on my follow up at-least 15-20 mothers of these young who died in 2010,” he adds. 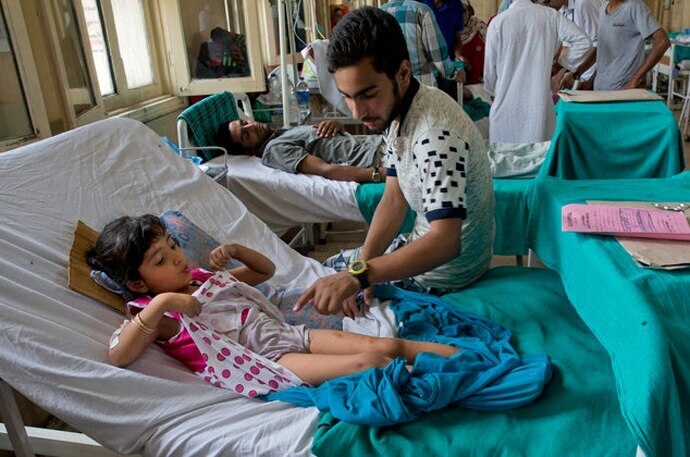 Since the unrest started, many wards in hospitals of the state are full of those wounded in the protests. 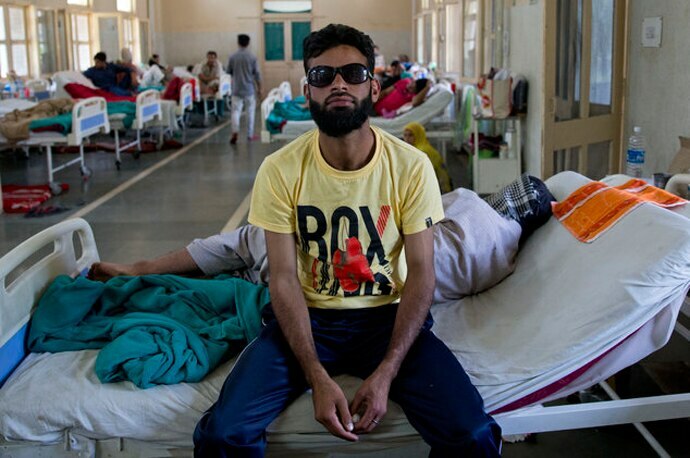 At SMHS hospital, Srinagar, several wards are packed to the rafters with those hit by pellets in the eye. Bandages or dark glasses partially cover the faces of rows of injured men, mostly in their teens or early 20s. They are no props to look cool, rather a necessity to keep the operated eyes cool. Among the victims are children as young as eight years old. Few of them have lost vision in both eyes. However, spokesperson of Central Reserve Police Force (CRPF), Rajesh Yadav, sees them as “misguided youth who should invest their time and energy on their studies.”He said they, in fact, are not using excessive force against the protesters. Meanwhile, an affidavit filed by the CRPF informed Jammu and Kashmir High Court that it had fired 1.3 million pellets from pump-action guns between July 8 and August 11. 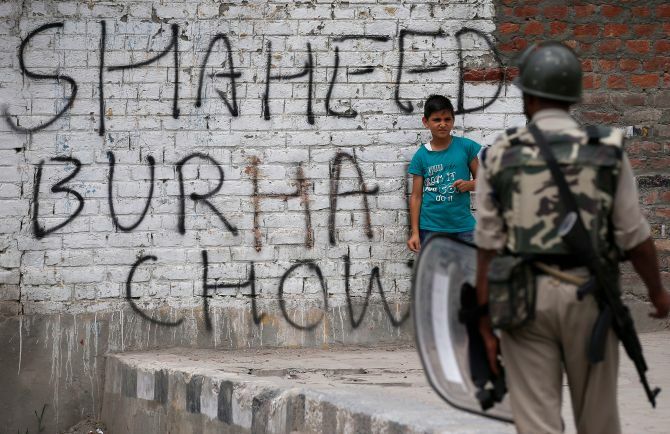 Pellets or pump-action guns were introduced in Kashmir as a “non-lethal” alternative to bullets after 200 people were killed between by security forces during demonstrations against “Indian occupation” between 2008 and 2010. The government’s reasoning was that when fired from a distance, shotgun pellets disperse and inflict only minor injuries. As a large group of youngsters live in the irrevocable fear of getting arrested, Dr Hussain observes a rise in substance abuse among the youth. Problems are varied, however small they may seem for those who are away from the 58 day-old curfew. Shahid Wani, an entrepreneur in his mid-20s, is frustrated for his own reasons and says he has taken to smoking more than he did. “I am not able to see my girlfriend since the curfew started.” She lives in downtown area of the city, where the protests are most intense. Senior journalist Yusuf Jameel feels there is a difficult life ahead for Kashmiris, more so for the pellet victims. Even now, the pellet victims at the hospitals have to hide their identities to avoid being detected by the security forces as they fear they might be taken as stone-pelters -which could lead to detention, arrest and torture. He asks: “At this point everybody is overwhelmed, there are sentiments, and everybody is offering help and the question is whether this will continue and what will happen after, say five years?